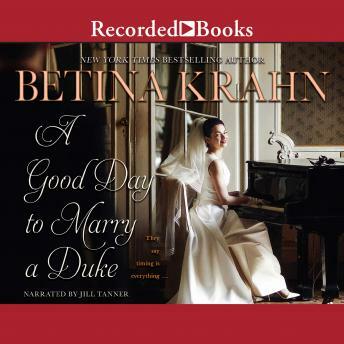 From award-winning New York Times bestselling author Betina Krahn comes a beguiling new romance brimming with her signature wit, timeless sensuality, and thrilling romance-as desire proves to be a great equalizer. Daisy Bumgarten isn't thrilled to be trying to catch a duke's attention while dressed like a flower pot caught in a swarm of butterflies. But, after all, when in Rome (or in this case London society).. Since her decidedly disastrous debut among New York's privileged set, the sassy Nevada spitfire's last chance to "marry well" lies across the pond, here in England. If she must restrain her free spirit, not to mention her rib cage, so be it. She knows she owes it to her three younger sisters to succeed. Now, under a countess's tutelage, Daisy appears the perfect duchess-in-training.Until notorious ladies' man Lord Ashton Graham, a distraction of the most dangerous kind, glimpses her mischievous smile and feisty nature-and attempts to unmask her motives. Daisy has encountered snakes on the range, but one dressed to the nines in an English drawing room is positively unnerving-and maddeningly seductive. When a veiled plot emerges to show up Daisy as unworthy of the aristocracy, will Ashton be her worst detractor? Or the nobleman she needs most of all?